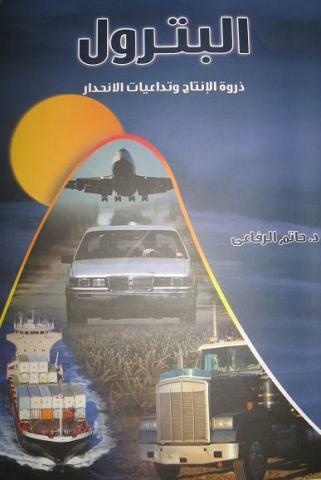 A new book on peak oil has been released in Arabic. The title is “Oil, peak production and the consequence of decline” and the author is Hatem Elsayed Hany Elrefaai from Egypt. The book offers an overview of the problems related to peak oil and fossil fuel depletion along with potential impacts on the society. It is good to see that the question of peak oil is being discussed in the Arabian countries, especially since they control the vast majority of the known remaining oil reserves. Given the significant dominance of oil in many Arabian economies, a more strategic thinking and discussions about the future are of importance to tackle the problems imposed of depletion. Discusses how access to energy was/is a vital resource for humankind development along the history. It starts from the hunting age to grazing, to farming, to the industrial age. From using the wind to wood to coal, then oil. Chapter 2: Oil: Three important numbers. The annual world oil consumption as of 2006. The total amount of oil consumed since the beginning of humanity. An average number for the current proven reserve. Chapter 3: Peak oil: Not a theory but a fact. USA National Petroleum Council report. Fredrik Robelius Ph.D. thesis from Uppsala University. ASPO and the authors experience from the recent ASPO-conference in Cork. Sweden’s declaration to be oil independent by 2020. It discusses consequences of peak oil on economics, transportation, agriculture, tourism, globalization, social life. It also shows that the ball is already starting to roll in many parts of the world. Chapter 5: Is there a substitute? This chapter is devoted to discussing all other energy resources; natural gas, coal, nuclear, hydro, geothermal, biomass, solar, wind, tidal. The chapter ends by talking about batteries and hydrogen cells as ways of energy storage. The main focus of the chapter is to discuss if these resources can mitigate the transportation and food supply problems. Chapter 6: What to do? It discusses ways to adapt to the new life environment that we all have to live in. It starts with personal adaptation up to the national level with the implementation of an Oil Depletion Protocol. Chapter 7: The Future: International and domestic. This chapter looks at two pictures: the first is on the global stage where it discusses the strength and weak elements in each of 6 important countries; namely: The USA, European Union (it is almost one society), Japan, Russia, China, and India. The second is on the national level where it discusses the strength and weak elements of the Egyptian society and proposing some ideas to overcome expected hardships.